Written by Emma Barnes on February 25, 2015 . Posted in Coding and other skills, Editorial, How-To, Production, Tech, Workflow Tools. and gives a bit more information about this part of the file – which is that this code is XSL. Line 3 is where it starts to get interesting. Now, next time I want to give my office location, I don’t have to spell out the whole thing. The variable “address” is a shorthand way of saying the whole thing. Back to our code. 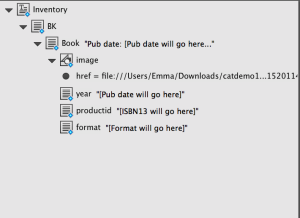 We’re going to define three variables on the next lines: one called “form”, one called “date” and the other called “isbn”, so we can use them later. We’re getting the values of the variables from the ONIX file. We select the data tagged up with “ProductFormDetail” and assign it to the variable called “form”. Similarly, we find the value in the ONIX tagged up as “PublicationDate”, and save that as the variable “date”. Lastly we find the bit in the ONIX tagged up as “ProductIdentifier[ProductIDType = ’03’]/IDValue” and set that as the variable called “isbn”. That last one is a bit complicated but if I show you the ONIX, it’ll make more sense. This is quite self-explanatory. On line 11, we spark up another XML tag, called <format>. But what to put in this tag? The syntax says “Choose from the following: when the ONIX form variable is B104, put in A Format Paperback. When the ONIX form variable is B105, put “B Format Paperback” in our new <format> tag.” And so on. And my dear readers, you are done. Well done – you’ve read through a piece of code which contains pretty much everything you need to know about XSL. Bravo. The next bit’s easy, and best shown on video. Watch how we’re going to use our XSLT code to transform ONIX into a more concise XML file and automatically flow it into our InDesign template. (You’d best watch it on HD so you can see the detail.) And that’s it. Use the files you’ve downloaded to have a practice, and then find your own company’s ONIX file and have a go. Then, tweak the InDesign template so that the colours and fonts are to your taste, and produce your own catalogue. This demo is a deliberately pared-down example. You’ll likely want to include more information such as the title, the blurb and the price. I can recommend A Designer’s Guide to InDesign and XML which contains even more templates and excellent descriptions of how to start using InDesign properly and productively. You know, we could have automated this catalogue’s production in a number of ways. If you use Bibliocloud, you can export pared-down XML without having to convert ONIX, or you can export data directly to PDF. If you still store your metadata in Excel, you can get it to export an XML file. The point is that if you explore the tools you have available to you right now on your machine, you’ll find that your computer could be working a lot harder for you. Automation is the key to a happy modern working life – and when your happiness is at stake, that’s worth a bit of an investment of time in learning about automation processes like this, wouldn’t you say. I try but I didn´t make your template work. I just do like in the video and nothing happens (changing nothing in the doc).